Sustainability demands are expanding and companies today are no longer buying and negotiating based solely on price any more. More and more large corporations are under immense pressure from stakeholders to offer transparency with regard to their sustainability and CSR (corporate social responsibility) practices, and this includes their supply chains. Recognizing the need for transparency in sustainability, in 2012 Aarts Plastics began to work on a full sustainability program. Over the last years the company, based in the Netherlands, has been assessed by EcoVadis several times and in 2014 was awarded a silver medal. This year, in June 2016, the company participated in the EcoVadis corporate social responsibility evaluation program. Following an analysis of CSR practices based on 21 criteria, Aarts Plastics has received a gold medal rating, the highest possible CSR performance medal available from EcoVadis, a result achieved this year by only 5% among the many companies evaluated worldwide by EcoVadis. The areas assessed include environmental impact, labour practices and human rights, fair business practices, and responsible/sustainable procurement. 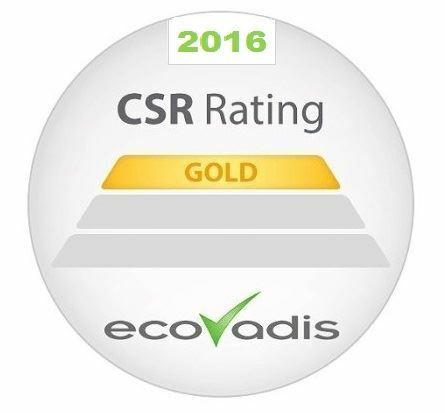 EcoVadis can provide reliable CSR ratings and scorecards covering 110 countries based on three core concepts: people, process, and platform. Aarts Plastics is a plastic converter of standard and customized packaging for the cosmetic, food, and medical market. By integrating all disciplines, from design to mould construction to state-of-the-art production in a modern plant, Aarts can offer total solutions for a company's packaging ideas.